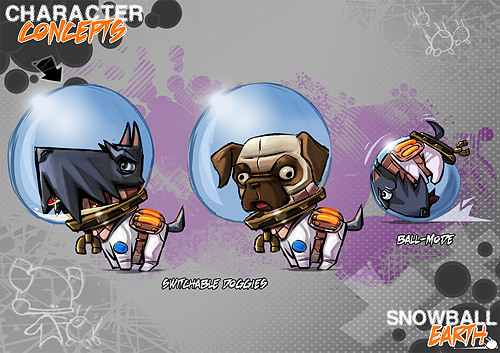 Today we have released the complete playable prototype of our cancelled game Snowball Earth! This is the game that we worked on at Ronimo for a full year in 2007 and 2008, before we made Swords & Soldiers. 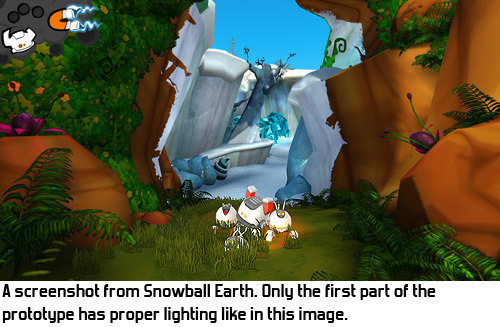 Since Snowball Earth was never finished, we never really talked about it either and kept the prototype hidden. Such a waste! The prototype contains over an hour of gameplay and some really cool ideas, so I would like to share it with everyone today! The prototype was entirely made in Ogre, which is of course why I am posting it here. It uses a lot of tools and basic code from De Blob and Proun, two other Ogre projects that I worked on. Unfortunately it was cancelled in 2008, but for as a studio it was a blessing in disguise: we learned our lessons and went on to create something smaller, which became the award winning Swords & Soldiers. Recently we released Awesomenauts. Especially the systems to make snow melt, grass and plants grow and trees unfreeze was a pretty complex technical accomplishment and one that I am really proud of (also because of the great art our artists made for it), so I will write a future blogpost about that at some point. I'd love to hear your opinions on how it plays! Last edited by Oogst on Fri Dec 21, 2012 3:00 pm, edited 1 time in total. Very interesting to hear the out come of it and why it turned out that way. But seriously, it looks and sounds AAA to me. Maybe the idea just didn't have enough roots to begin with, but great job anyways. Oogst wrote: Especially the systems to make snow melt, grass and plants grow and trees unfreeze was a pretty complex technical accomplishment and one that I am really proud of (also because of the great art our artists made for it), so I will write a future blogpost about that at some point. That melting effect is very nice. Interesting to read about the project on you blog. Super stylish video. Some of the artwork looks a little Dr. Seuss inspired. Pro job Oogst, it's always a treat to see the stuff you've worked on. Haha, that's really interesting, since all the shaders were custom written. What made you think that? answering from here: probably the aliasing on plants and trees because of the low resolution and the fact that I was using ogre just before watching the video. It's was an interesting project, is there any possibility to see it again in the future? EDIT: will you be at italian game dev summit in Milan too? It's such a pity this awesome project didn't see the light of the day at the time. Have you ever thought about publishing it on your own? Ologon wrote: ... It's such a pity this awesome project didn't see the light of the day at the time. Have you ever thought about publishing it on your own? The project would be very big to complete, so we would need a serious budget to finish it. This one is a lot larger still than Awesomenauts, and that took us 3 (!) years to complete. So to finish Snowball Earth, we would have to double our team size and spend a lot of time, which is just too expensive for us to do. New blogpost about Snowball Earth! 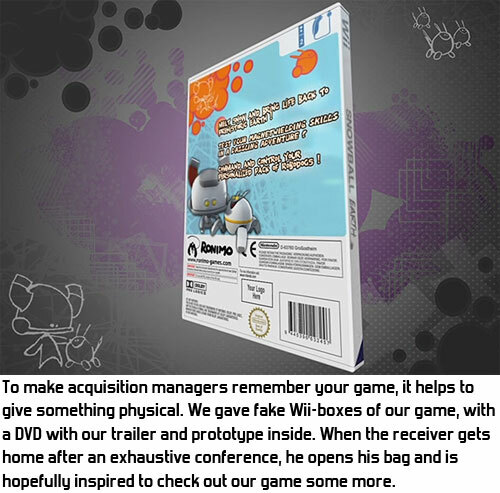 This time one about the business of game development: about how it works to pitch a project to a publisher and get a deal signed. That's a big checklist. A lot of useful information in that blogpost that will come in handy to many indie studios. Thanks for sharing that! An interesting read indeed. I used to be on the publisher side of that. Hearing it from the developer side is pretty interesting indeed. masterfalcon wrote: I used to be on the publisher side of that. Hearing it from the developer side is pretty interesting indeed. Which makes me extremely curious to know to what extend you think my blogpost is correct, and which parts you disagree with! Any chance to resurrect this project? I suppose this should be a really fun! Slappy wrote: Any chance to resurrect this project? Nope, we are going to resurrect it, but you can download what is there already! There is a full hour of gameplay in there! WOW! This game is so cute and so cool! "Unfortunately it was cancelled in 2008"... Yep! Only the good things are hard to come to "life" (and I am a "pro" in canceled projects, caused by lack of founding, too). Today to be a cool game, it must have lots of violence+blood+zombies+retarded stuff... Well, no matter what... I have ever refused to develop that kind of games (but thats me, of course). And, i´ve small kids, and "Snowball Earth" its just the perfect kind of game that i would buy for them. LOVED IT! WELL DONE! As some requested, here's a post about how the melting effects were created! I'll discuss the snow/puddles/grass/deformation shader on the ground next week in a bit more detail! Oogst wrote: To manage the melting, the game has a big 2D map of the level (a grid, really) and for each point on the map, it stores how much it has melted yet. 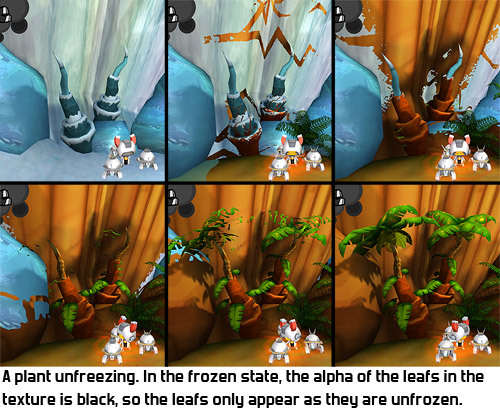 By walking around, the player turns the parts of the map from frozen to green. This map is then used by all elements in the level to determine to what extend they should show up melted. Ah, that was my guess. Thanks for posting, looking forward to the next week's one.